Home » Bathroom Help Category -- Also note those subcategories in the orange navigation, above! 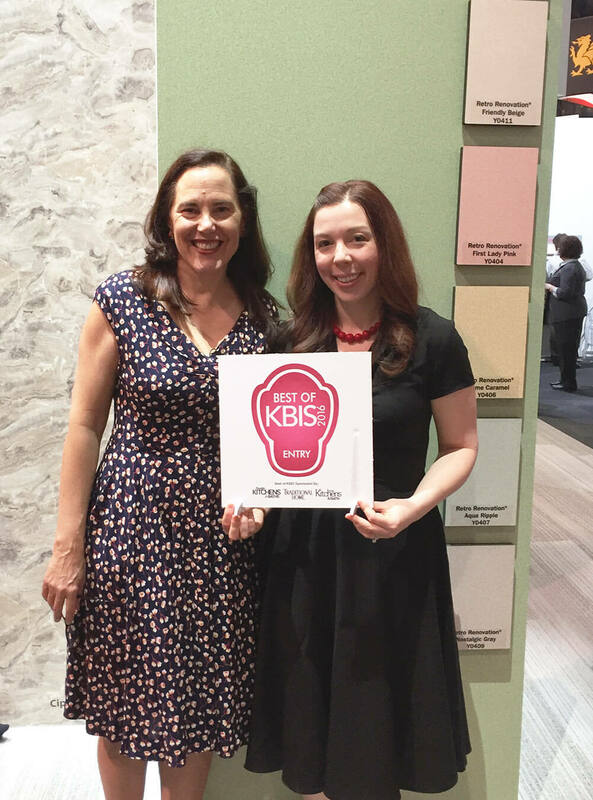 » Retro Renovation on the scene at KBIS 2016! 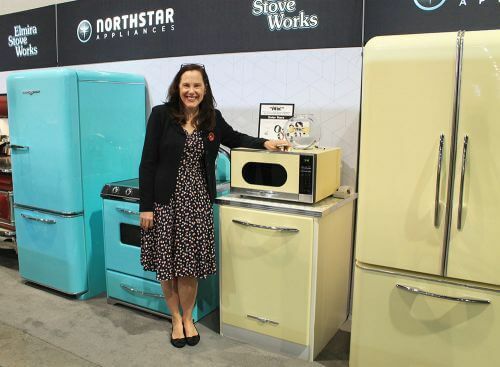 Retro Renovation on the scene at KBIS 2016! 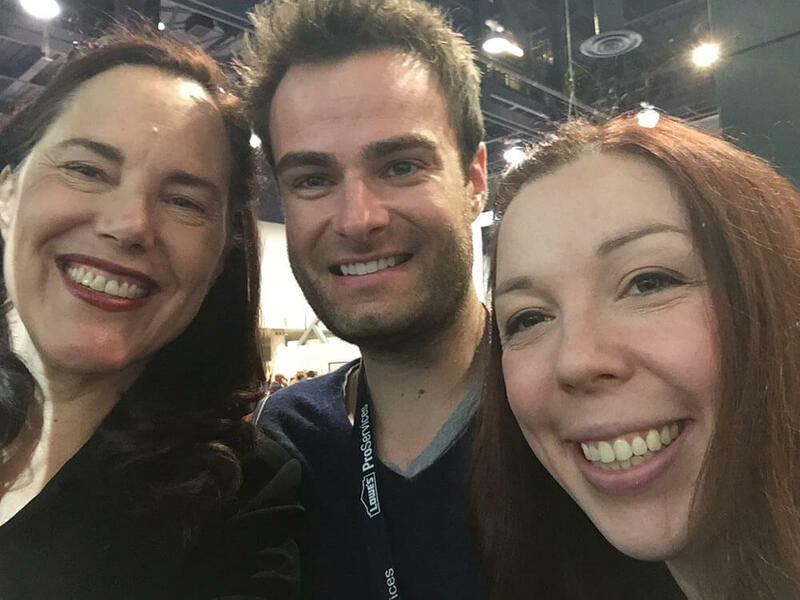 Our Las Vegas Laminate KBIS 2016 Adventure last week was a whirlwind of meeting many interesting people (including readers! 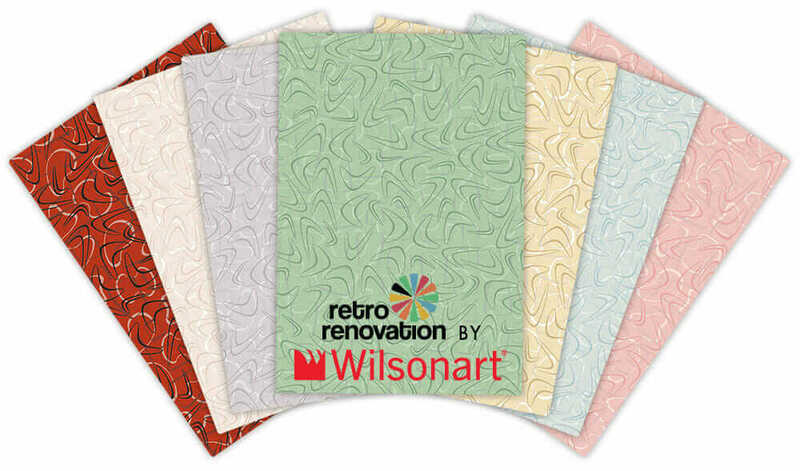 ), seeing tons of new home-building products — and yes, some of them were retro-styled — and of course, launching our new Retro Renovation® for Wilsonart® boomerang laminate collection. All this, while wearing our pretty vintage-style dresses and shoes. Here are some highlights from our two days at the show — there are more product stories in the works, too. 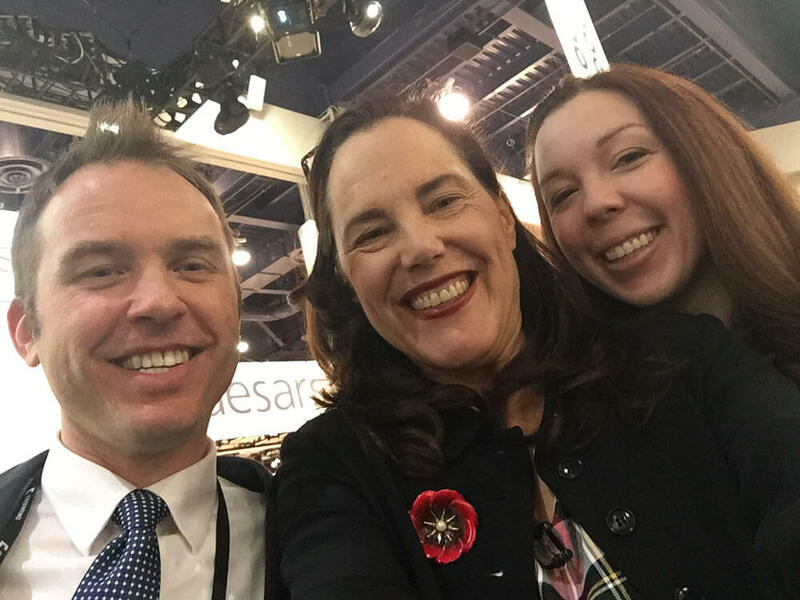 Disclosure: As part of our collaboration on the new laminate collection, Wilsonart paid our travel expenses to this show. 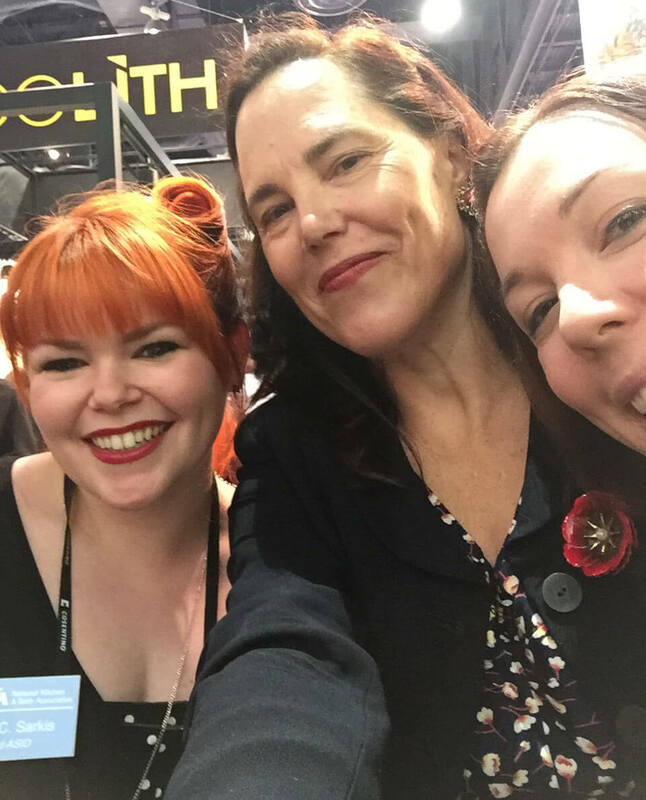 No specific coverage beyond our launch announcement was promised as part of “the deal.” You can read how Publisher Pam makes money with the blog to pay Kate and sometimes even herself here. Back at the hotel that night, Pam tried on my Hell Bunny dress — she said it also looked divine on her, and she ordered one for herself when she got home. This is ONE FANTASTIC DRESS! Oh yes, and my shoes — those Miz Mooz red shoes were a huge hit. I received so many compliments that I lost count. Pam said they stole the show! On comfort, the verdict was: They are not bad at all for 3″ heels. 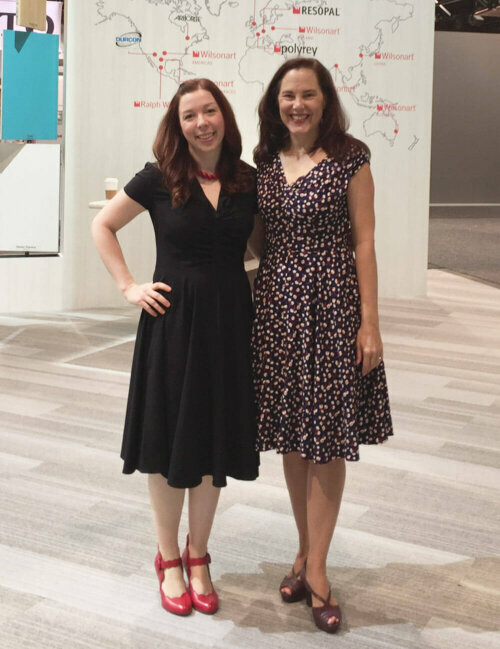 I do not wear heels often at all — maybe 3-4 times a year — and I wore these shoes straight out of the box for about 6 hours, standing most of the time, but also doing some walking around the show. 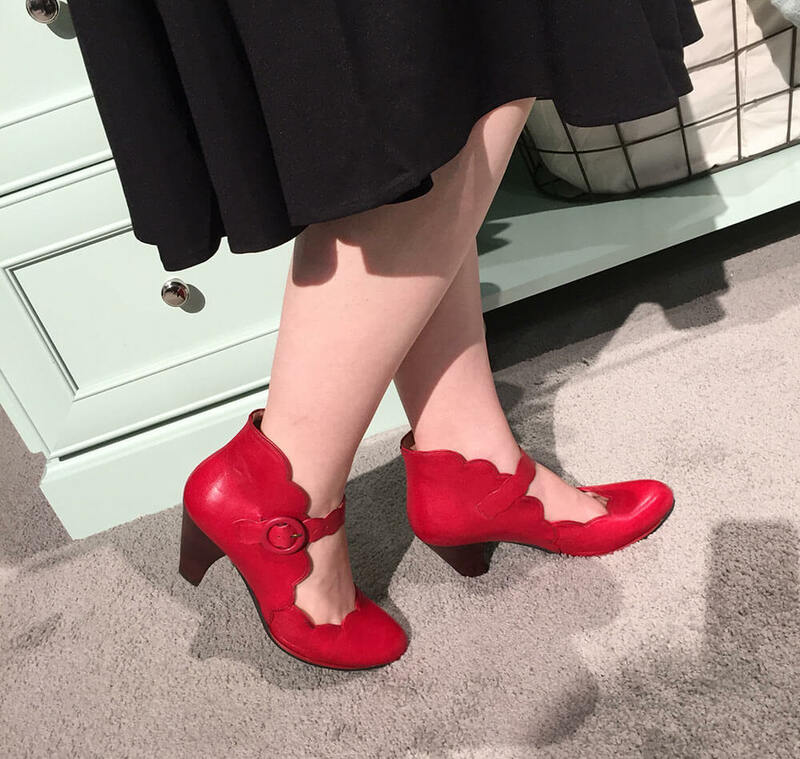 They were quite comfortable for the first 5 hours, but that last hour had me searching for a chair and a pair of flats, which could be due to me not being used to wearing heels instead of these fabulous shoes. Pam said she kept slipping out of her brown platforms — she has a high arch — but she loved the way her shoes looked. 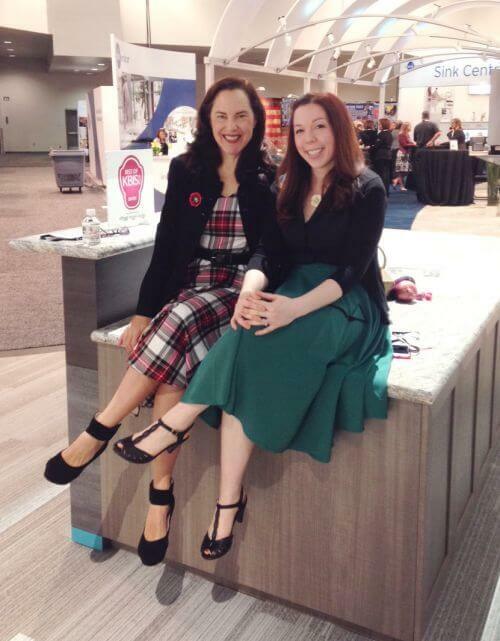 On day two, Pam wore her plaid Hell Bunny dress with her oh-so-comfortable Sacha London black suede shoes. The weekend before our trip, she scored the black Anne Klein blazer for $2 at a Goodwill. She added a red enamel flower pin (both days) for pizzazz. She LOVES these shoes. When she arrived back home, she also ordered these same Sacha Londons in brown suede. For my outfit, I opted for the teal Hell Bunny skirt paired with the black button up retro styled cap sleeve blouse and a black cardigan to chase off the chill. My shoes are my Seychelles heels, which were shorter than the Miz Mooz heels from the day before. We both want to mention: WE LOVE HELL BUNNY DRESSES and SKIRTS. The fabric has that vintage rayon feel – but with a little bit of modern stretch – it’s not too thick not too thin, Goldilocks just right. 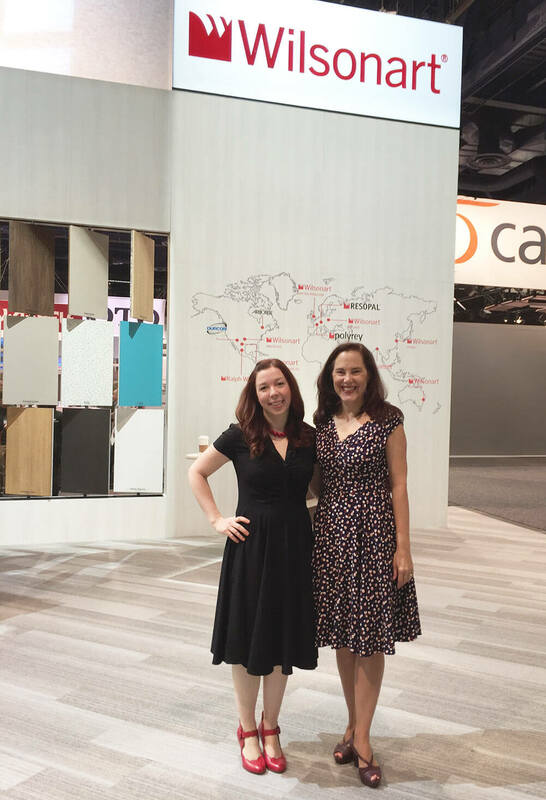 It’s an understatement say that it was exciting to see our laminate display at the Wilsonart booth at KBIS 2016. 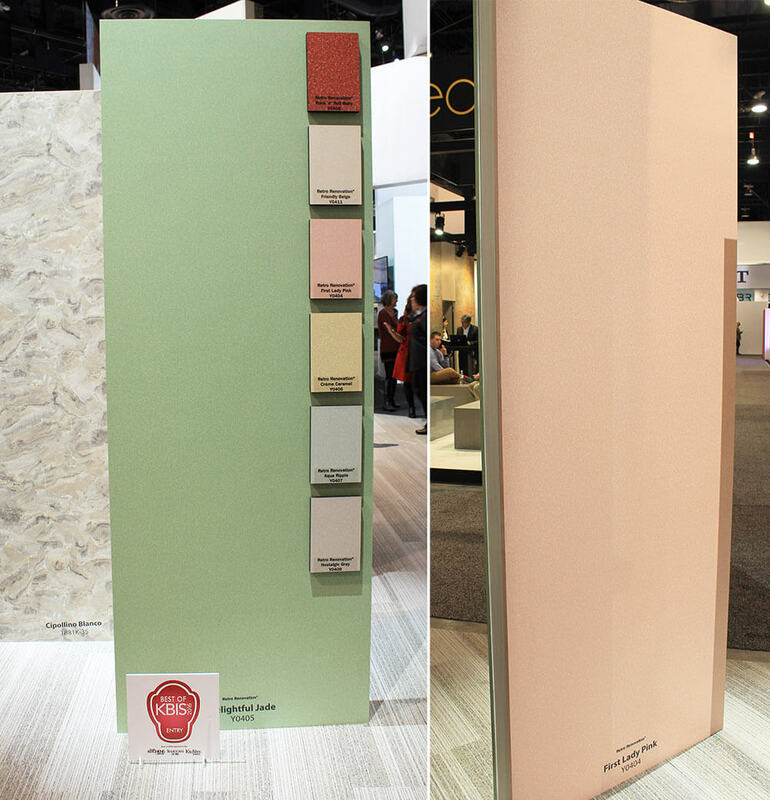 The boomies were displayed on a two-sided, freestanding board with a large sample of Retro Renovation® Delightful Jade on one side and the same-sized sample of Retro Renovation® First Lady Pink on the opposite side. The other six colors were mounted on the Jade, which sat at the corner of the entire Wilsonart display, facing into two intersecting aisles. 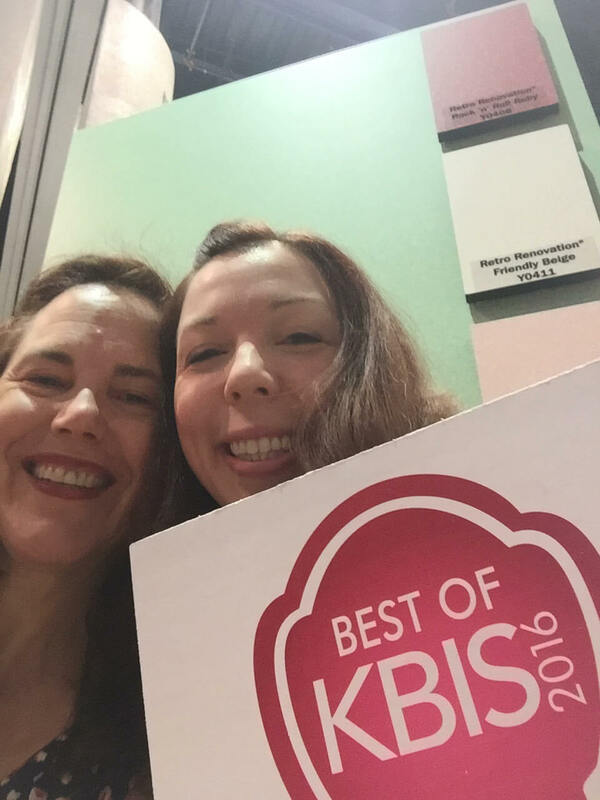 We were entered to be in the running for “The Best of KBIS”, too! We didn’t make the finals, but woot for the retro! Pam held four (or was it five?) media presentations right in front of the full sample board. Media generally include groups of 20 — there were “long lead” shelter magazines… at least two big groups of bloggers on a special media tour… and we met with two groups of “30 under 30” designers. We think. Pam’s head was kerfuffled, they just put a mike in her hand and off she went with the entire story! Good morning (or afternoon). Over the next few days here at KBIS 2016 we will all be seeing the latest, the greatest, the future of kitchen and bath design. But for the next few minutes, it’s throwback time — we’re going to be talking about 1950s-design laminate. But here’s the twist on this story — these laminates would not be possible if not for the latest, the greatest, the future of made-to-order laminates available today from Wilsonart. 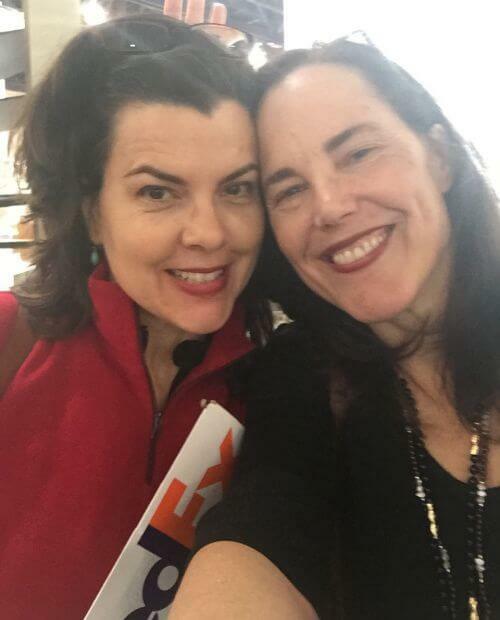 Hi my name is Pam Kueber, and I am the publisher of RetroRenovation.com, here with my colleague managing editor Kate Battle. 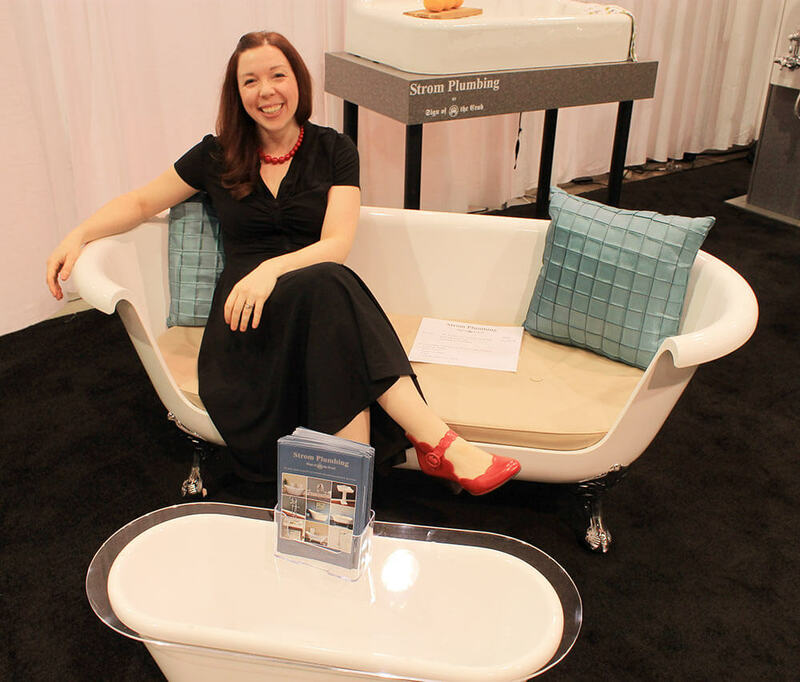 Our jobs — day in and day out — are to research and report on products that owners of midcentury and vintage homes can use to remodel and decorate in a way that’s sympathetic to their homes original architecture. Over the 10 years I’ve been blogging, I’ve found that one of the greatest wants and needs, consistently, of Retro Renovators is replacement countertop materials. Ironically, though, this also has been one of the products most difficult to solve for — even though retro design has been an important trend, it’s still a niche market. 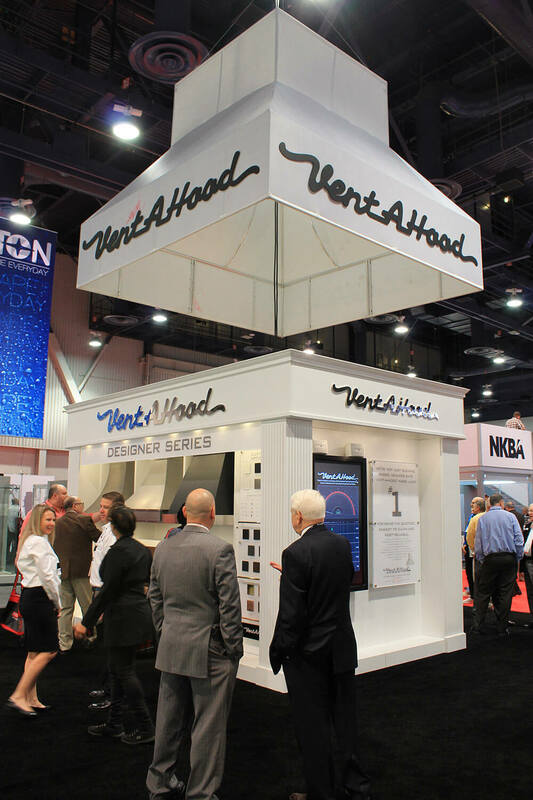 Mind you, we prefer abstract-patterned laminates in just-right colors, because that’s what was used back in the day. Now though, modern technology is coming to the rescue. 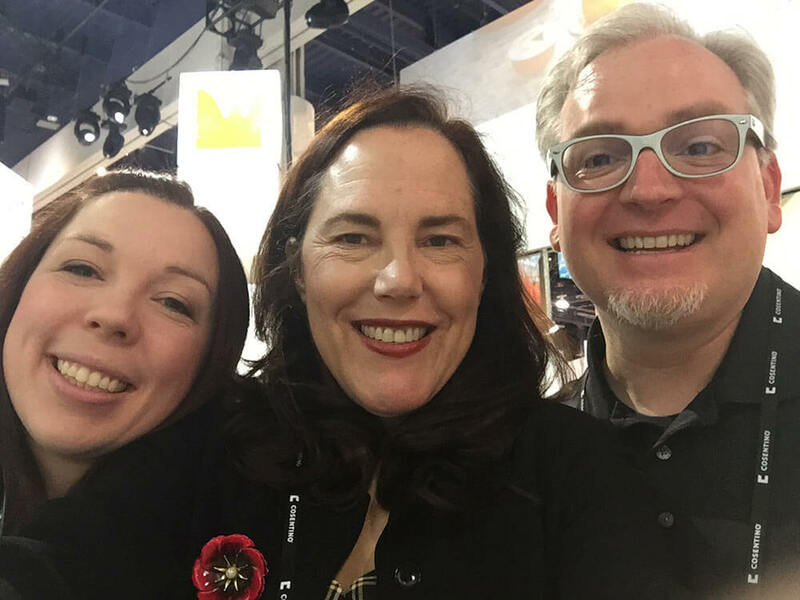 On a visit to Wilsonart’s operations in Temple, Texas, I saw, first-hand, the capabilities of their Virtual Design Library — their growing collection of curated laminates made-to-order – unique-design laminates that can help meet the needs of niche markets… ever-fragmenting markets. When we met, Wilsonart was genuinely interested in my ideas for creating more laminates for the Virtual Design Library that would appeal to midcentury enthusiasts. To start, I suggested we pursue some new retro classic colorways for their existing boomerang design. And today it’s exciting to unveil the new capsule collection – Retro Renovation® by Wilsonart — seven colorways derived from popular 1950s kitchen and bath palettes in a crowd-pleasing abstract, tone-on-tone Googie pattern. Retro Renovation® Delightful Jade inspired by vintage jadeite milk glass and iconic color and collectible. Retro Renovation® First Lady Pink, a warm pink popularized by Mamie Eisenhower that was super popular in pink bathrooms. Some of you also know about our microsite, SaveThePinkBathroooms.com – hey, here’s another product to help. 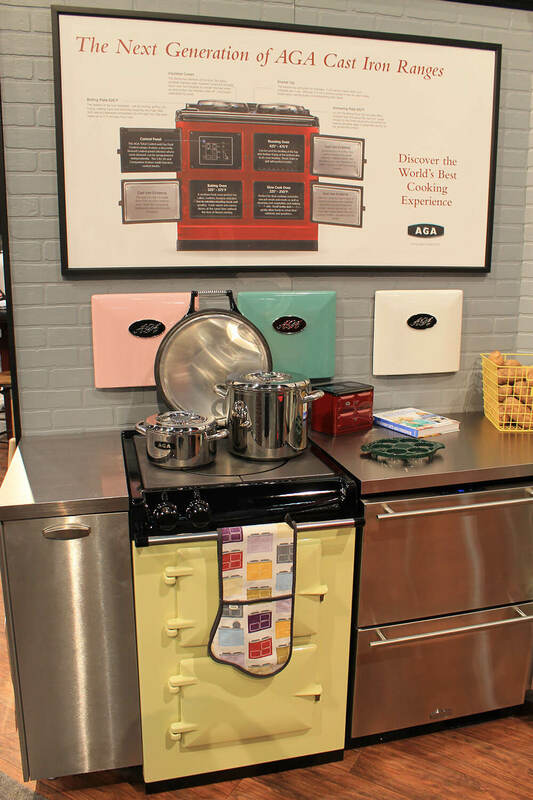 Retro Renovation® Creme Caramel should look great with wood cabinetry including our beloved pnotty pine. Retro Renovation® Aqua Ripple also plays well with blue. Nostalgic Grey and Friendly Beige are our two warm neutrals . And Retro Renovation® Rock and Roll Ruby — the only design that’s not tone on tone – channels diners with waitresses on roller skates. Of course we all have our favorites. 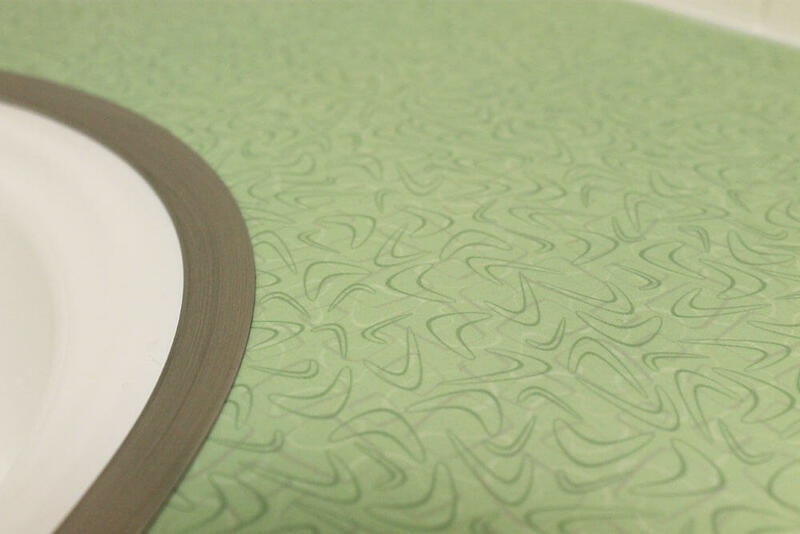 Wilsonart sent Kate the first full sheet ever printed — in Retro Renovation® Delightful Jade — and she installed it in her guest bathroom – check out the photo in your media materials. 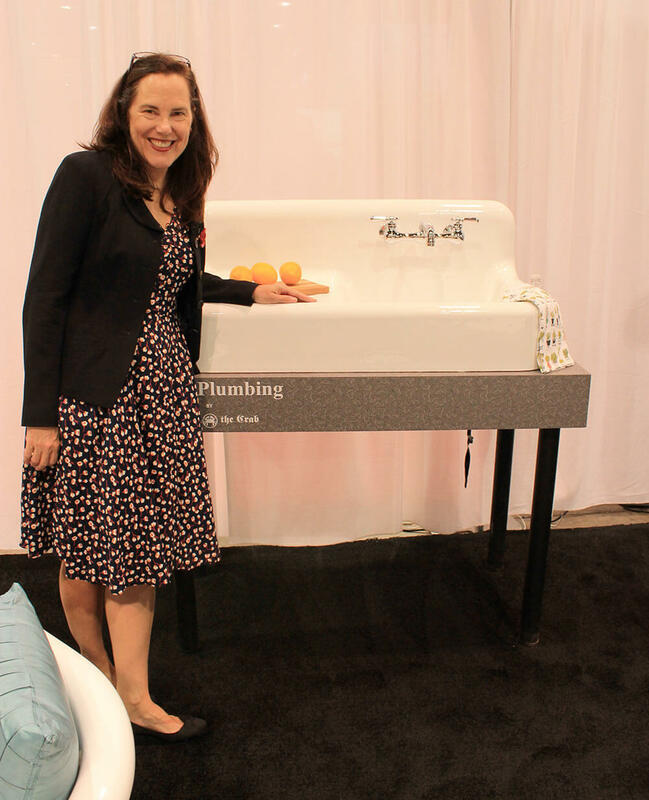 Kate, by the way, has mad DIY skills – she did her own tiling and built the vanity and countertop; she is a real star! 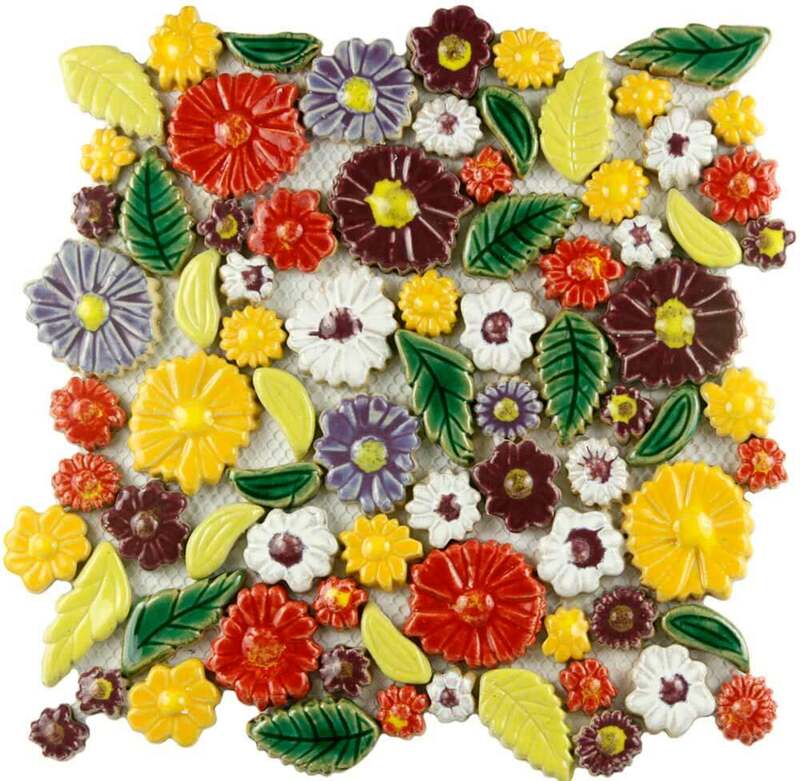 Visiting for Thanksgiving, Kate’s mother-in-law, totally unsolicited, told her that she absolutely loved it – and this, before she even knew Kate had helped design it. Of course, this is just the kind of market feedback we want to hear. This project has been really gratifying — a real labor of love for everyone involved. 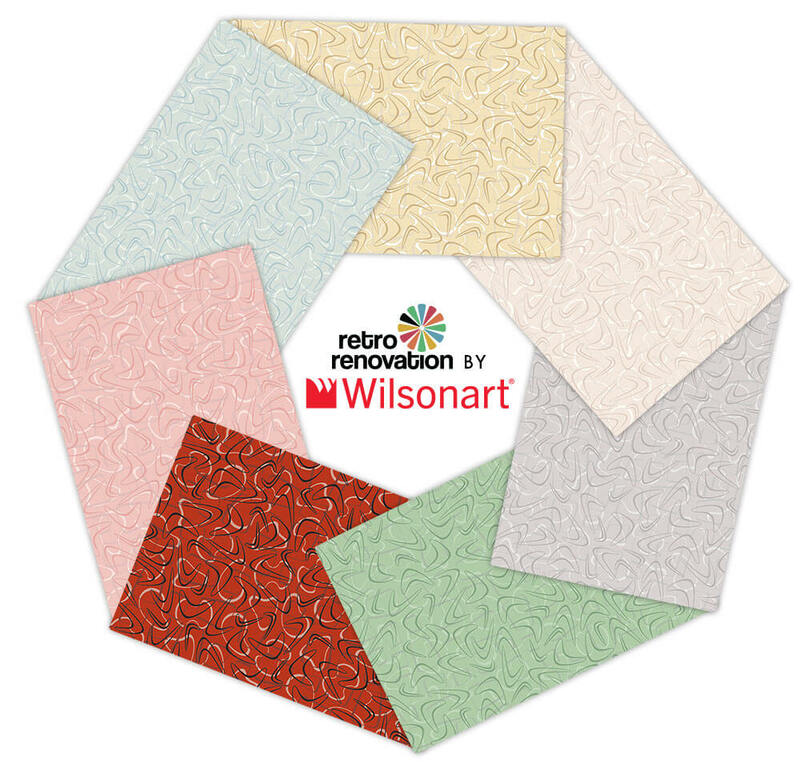 We are both so pleased and grateful that Wilsonart was willing to come out to play with RetroRenovation.com to give homeowners seeking out retro style even more countertop options. Yup, she pretty much said this over and over, with some variation for timing and such, with no notes. It was stressful — but that’s showbiz! A special shout-out to our good friend, design historian and materials specialist Grace Jeffers. Like us, she was part of the Wilsonart presentations. Moreover, she’s the one who introduced Pam to Wilsonart to get the conversation going about how we might work together to get more retro-style laminates to market. Thank you, Grace, much love from us to you! There was plenty to see at KBIS, including Vent-A-Hood’s cleverly designed booth, which made us giggle! 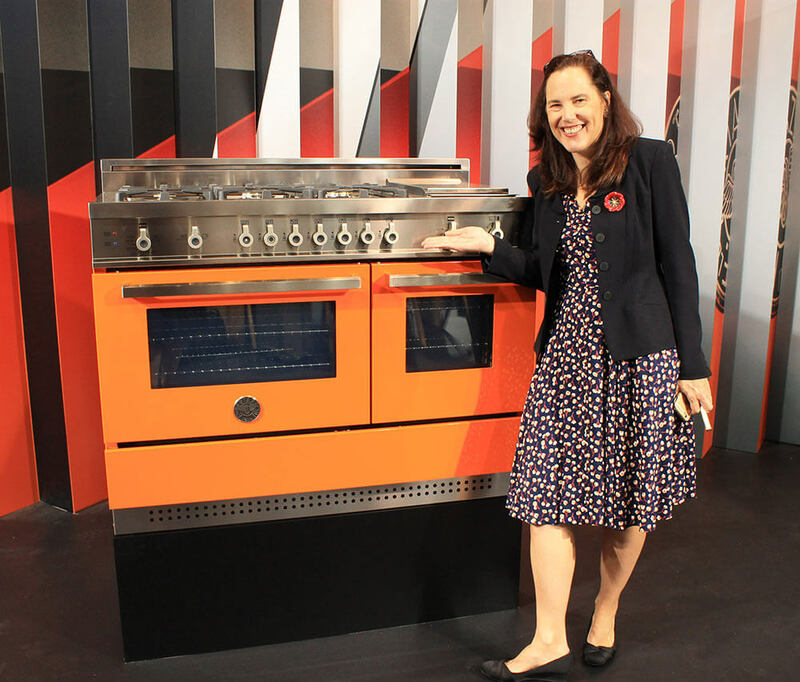 And, though it is modern, this orange stove from Bertazzoni really caught our eye! 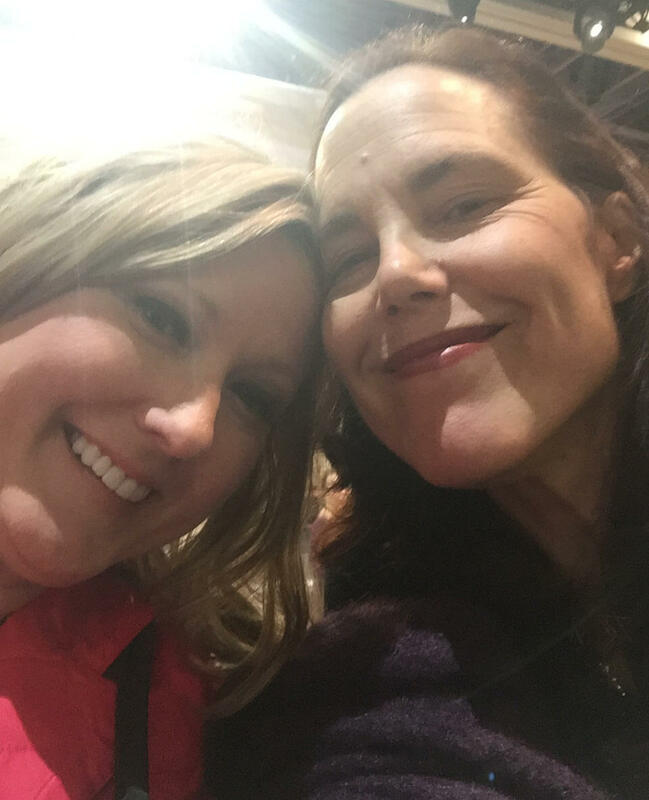 Oh, and you can see Pam’s navy jacket here. The platforms came off for the big walk around KBIS and even then, she got blisters. 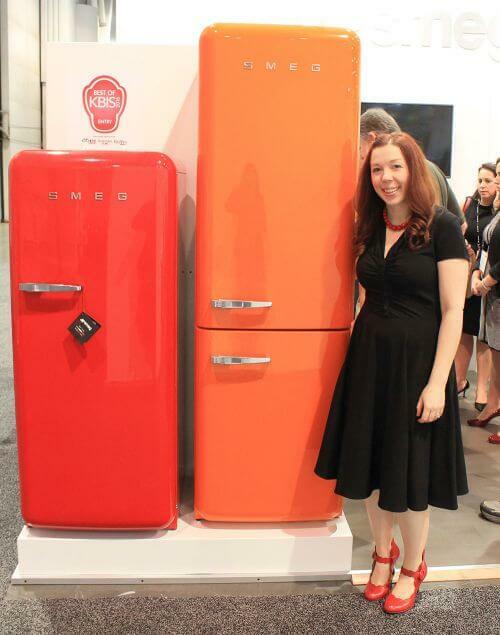 As you would guess, we absolutely loved the colorful, diminutive refrigerators at SMEG. 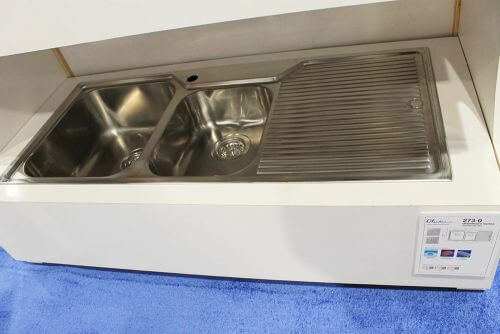 And we spotted one of NBI Drainboard Sinks’ vintage style cast acrylic sinks in a cute MasterBrands Cabinet display, too. Yay to Disclosure: this longtime Retro Renovation advertiser! Nicely played, Kent! 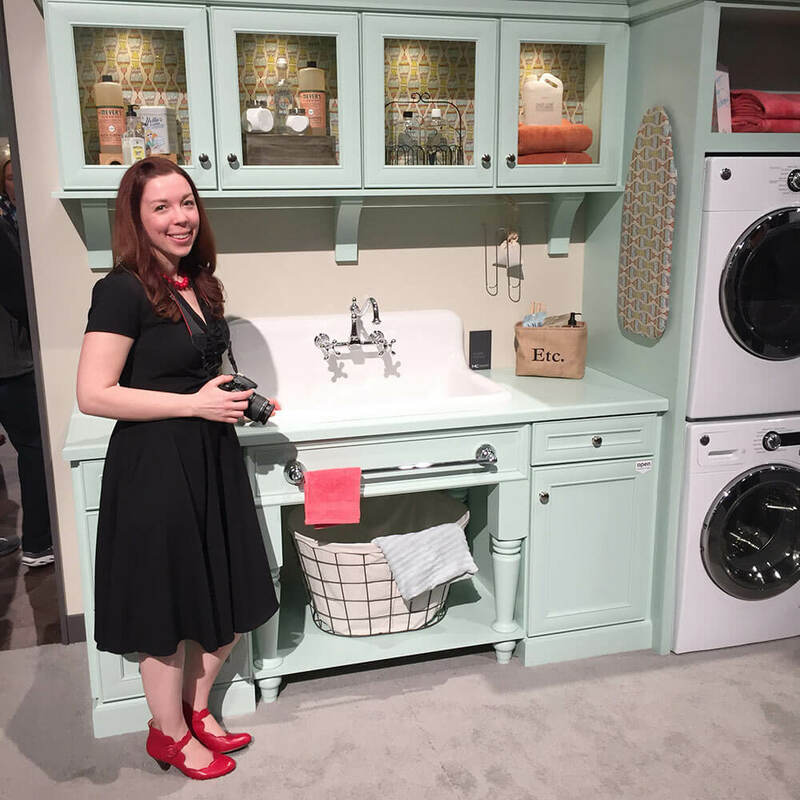 Everyone loved this laundry room mockup — what a super happy space! This was the first time we’d seen an NBI sink in person — the cast acrylic finish looked nice, Pam thought — definitely a contender if you can’t find a pristine-condition porcelain-on-cast-iron or -on-steel drainboard sink. Plus, a great spot to take a load off and rest! Phew! And this was only a short Day #1 North Hall walk! 30-under-30 spotlight designer Jillian Sarkis, a kitchen and bath designer based in Rochester, NY — and a fellow retro enthusiast and cute-dress-wearer. Roger, whose refurbished St. Charles kitchen we will be featuring soon! “*Scott, will the midcentury modern fans in Northcrest like the new Retro Renovation® by Wilsonart laminates?” she asked him. *Ummm, *Scott, Pam says she hopes she remembered your name correctly! We got your business card — but Pam stashed all the business cards “someplace safe” when she was unpacking. As soon as she figures out where that was, we’ll doublecheck you first name! In the meantime, if you see this and her memory is wrong — email us — and please forgive us! 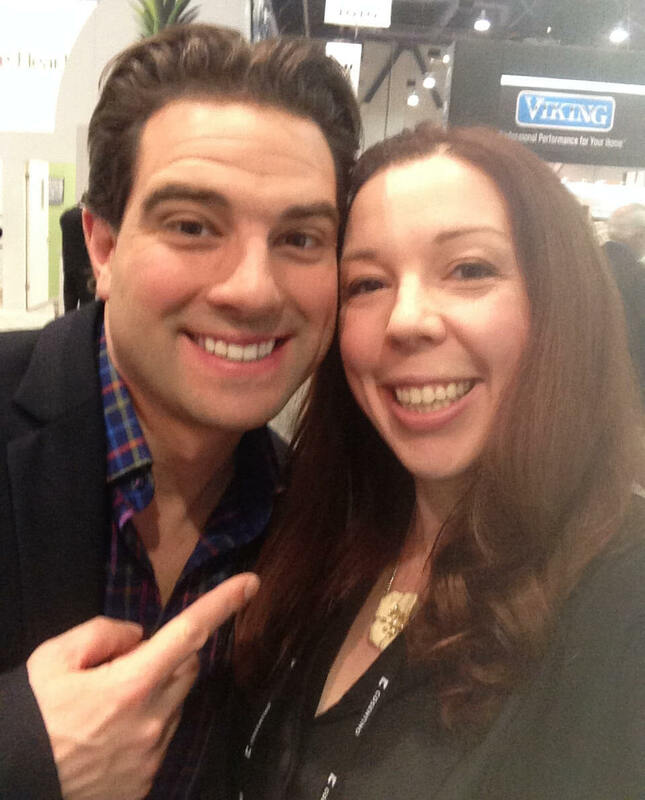 And finally, Kate happened to notice TV host Scott McGillivrey standing near the Wilsonart booth on day-two before the show started and was able to snap a quick selfie with him before he was wisked away to safety from his adoring lady fans. Kate’s mother-in-law is so jealous! 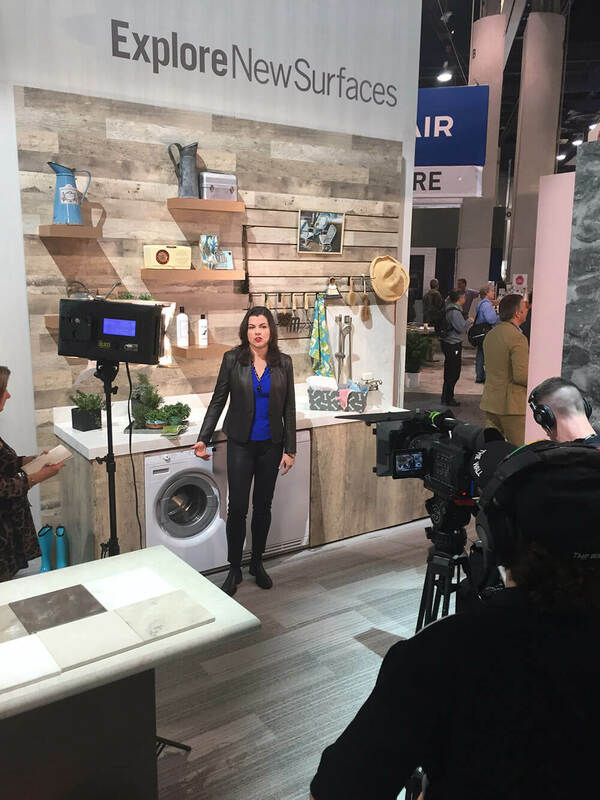 We’ll be back with more stories that spotlight some of our new finds from the show — products that are new or which we didn’t know about — that might help you get your kitchen or bath project done! Thanks for the tour, it looked like so much fun! I also want the laundry room! Super duper! Congratulations on everything! Congratulations to the both of you. I happy to see that you teamed up with Wisonart to introduce the company’s new laminate products. As a long time reader, I’m looking at redoing my man-cave bathroom later this year. Also, I attended junior college in Temple, and I remember the Wilson House quite clearly. Now that I no longer live in Texas, I’m going to use the Wilson House along with other ideas that have been show cased on Retro-Renovation web site to redo my man-cave. Keep up the good work you two! Wow, looking great! It would be a real scoop if you could get one of those HGTV stars to retro-renovate a kitchen or bath instead of smashing it up. At least Scott M. is better than most, although I about cried when he sold a Victorian columnade and spandrel (got to admit the resulting apartment floor plan was more practical) and painted out the trim on a Craftsman. Did you hear that Rehab Addict reinstalled a knotty pine kitchen in her old family home? I subscribe to her website, so I got it from the horse’s mouth. I haven’t seen it yet but stay tuned to DIY Network and HGTV. I sure wish they would feature more folks like Nicole who respect old houses. To me, renovating a house back to its original glory is just as, if not more so, impressive and camera worthy as “transforming” it into open concept. If they ever do such a show, maybe you two could be advisors!